Complete those painting jobs quickly and easily, with the 5 litre Spraystation. Suitable for use on indoor and outdoor surfaces, this all purpose sprayer makes it easy to get those walls, sheds and fences looking their best. The garden sprayer has been designed for use with most types of paint too, so it’s easy to refresh those colours and brighten dull surfaces in time for summer. The Spraystation general purpose sprayer paints a 1.83m (6' x 1.83m 6') fence panel in just 4 minutes! Simple to set up, easy to use and quick to clean. Perfect for all your indoor and outdoor painting tasks using most types of paints and finishes including gloss, undercoat, primer, emulsions, wood and fence treatments, and much more. Use on fences, sheds, decking. garage doors exterior walls and much more. British made for quality and precision painting. Has a 5-litre spray pack for continued spraying, 1-litre pot and 4 metres of hose, includes a 550w motor. 2-year warranty. Make indoor and outdoor painting simple with this handy Spraystation. It’s easy to brighten up fences and decking, add a fresh coat to your shed or give those surfaces an overhaul, and with your own garden sprayer you’ll be able to do it yourself with confidence. 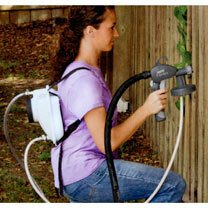 The Spraystation general purpose sprayer paints a 1.83m (6' x 1.83m 6') fence panel in just 4 minutes! Simple to set up, easy to use and quick to clean. Perfect for all your indoor and outdoor painting tasks using most types of paints and finishes including gloss, undercoat, primer, emulsions, wood and fence treatments, and much more. Use on fences, sheds, decking. garage doors exterior walls and much more.